In 2016 a group of nine educators from so-called ‘Changemaker Schools’ got together to share best practices from their classrooms. They used the time to figure out what was unique about the educational environments created at their schools, and to describe these in a resource for other educators. A changemaker, as defined by the Ashoka Foundation, is “someone who has both the will and the skill to make positive change and who puts empathy in action for the good of all”. As such, Changemaker Schools are those where changemaking, empathy and collaboration are prioritised. The Ashoka Foundation came to this term after years of working with social entrepreneurs and realising that for most of these individuals their education had been key to their choice of career path. Asking the question, “How do we cultivate more of these kind of people in the world?” Ashoka decided to foster the right environment for growth in schools. The Book Sprint was a unique one. Everyone was highly passionate about their work, self-aware and very open to collaboration. The organisers booked a house in a quiet snowed-in neighbourhood outside of Salt Lake City. Over the course of four days the group and the facilitator created an autonomous community, sharing rooms and cooking and cleaning together, while they tried to understand what makes a changemaker school and what other schools could do to become changemaker schools. The Book Sprint was also very challenging because it was trying to put into words what for most of the group had really just been an intuitive set of practices that had evolved over time. It was a perfect example of what we at Book Sprints call a ‘generative sprint’. While the group was certainly documenting practices, more importantly they were building a concept and a theory together, based on all their various experiences and expertise. 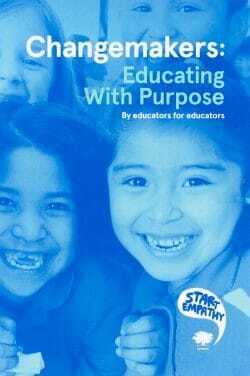 The book has since been published on Amazon and is used as a reference guide by educators all over the world.